Very few of us are getting enough CoQ10 in our diets, yet researchers say it is one of the most important nutrients to overall health. If you're not familiar with CoQ10, Dr. Mercola discusses it and so does the Weston Price foundation. As the articles point out, while our bodies can synthesize CoQ10, supplementation is often necessary. It turns out only a few foods contain much CoQ10. Certain organ meats such as heart are excellent sources. This isn't surprising --- organ meats contain a vast array of nutrients not found in muscle tissue. But for most of us in Canada, organ meats are a challenge. We don't like to eat them, because we weren't raised on them. Yet many of our ancestors ate organ meats in great abundance. It seems that, at least in North American culture, organ meats began to be phased-out of our diets and replaced with muscle meats. Some observers, including the Weston Price foundation, say this has led to nutritional imbalances, and therefore we should add organ meats to our diets. One word of caution though, and that is to remember that when we consume any animal products, the creature is acting as a food-concentrator for us. Everything the animal eats, drinks and breathes becomes concentrated in its tissues. This is doubly true for bones and organ meats. It's very important that the animal be as "clean" as possible --- eating, living and breathing as it was designed to. Free of pharmaceuticals, toxic materials, non-foods, heavy metals, and soy. This is where organic certification and humane certification are essential, because they are the only ways you have of verifying the farmer's claims. 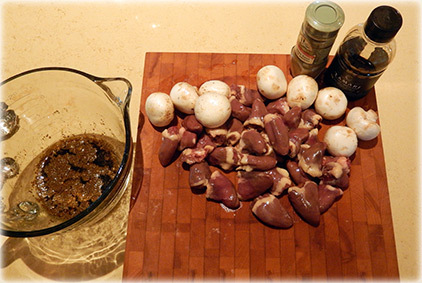 Since our family is looking for ways to incorporate more organ meats into our diet, we found a delicious recipe for chicken hearts. Since they are a tremendous source of CoQ10, and are also high in other nutrients including vitamin B12, they make an excellent nutritional addition to your meals. You may be surprised to know that chicken hearts are delicious, at least in our family's view. This recipe I'm about to share with you is very good. 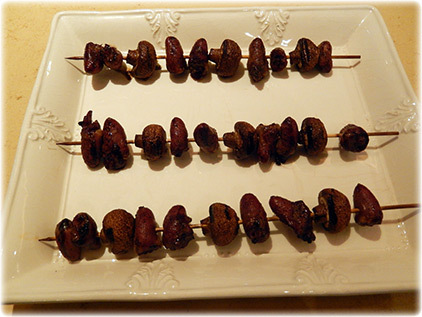 The taste of chicken hearts is very similar to beef tenderloin, only superior in my view. I adapted this recipe from famed author and chef Christopher James Clark's website. It's so easy to make this dish. 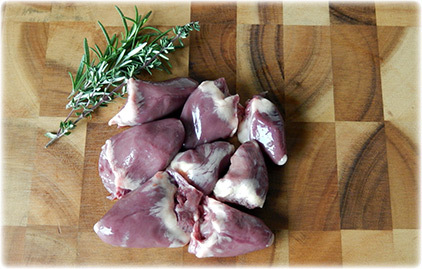 Simply take the organic chicken hearts as they are, no preparation necessary other than rinsing them. Although some people cut away the fatty tissue from the heart, I leave it intact because the fat only improves the flavor plus it adds a helpful nutritional component to the meal. Remember that CoQ10 is fat soluble. You start by adding the tamari sauce, sage and crushed garlic to a bowl and mixing them together thoroughly. Then you take the mushrooms (I leave the stems on them) and the hearts, and add them to the mixture. Let the solution marinate for around 20 minutes, more is fine. 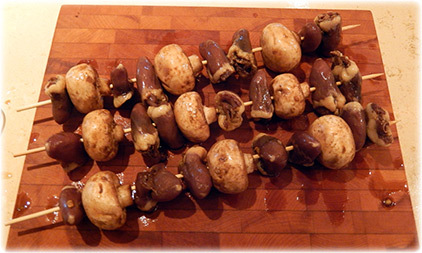 Then you take the hearts and mushrooms and put them on wooden skewers for grilling. 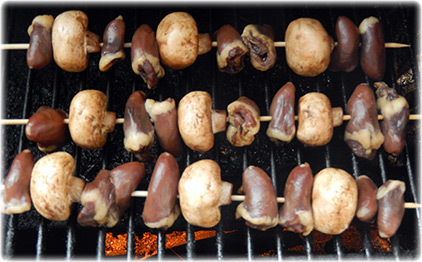 It's very easy, the chicken hearts are tender enough that they go on the skewer without a hitch. In my view, when you are planning this as a meal, about one skewer per person is plenty. Place the skewers onto a grill. I really like our wood-pellet grill because it adds a smoky flavor to the meat as it cooks, but you can just as easily use whatever grill you normally would. I grill the skewers at around 350 degrees, and let them cook for around 9 minutes on one side, then another 9 minutes on the other side. Once you're complete, then serve. I find the hearts surprisingly delicious and especially beneficial when you consider their nutritional punch. They are an easy way to begin incorporating organ meats into your family's diet! You can even buy soy-free organic chicken hearts right now.